This was a unique camp I ever joined. The duration is so short, just one and half day, May 28-29th, 2010. It only has 16 participants. But they are also special participants; they are 16 kids from Kembang Kuning cemetery. And the staff is not only Indonesian but also those who coming from US, Aussie, and Philippines. These kids live near Kembang Kuning Cemetery area. And they come to our ministry there, every Saturday. 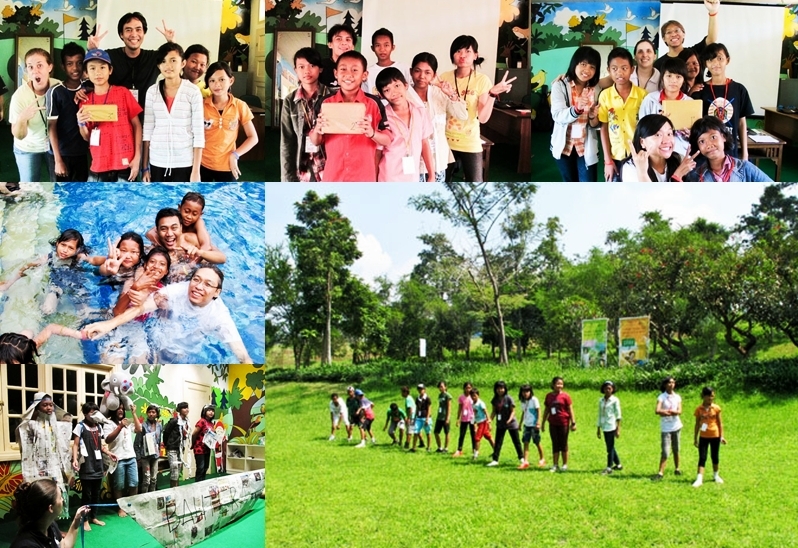 We take the kids from the 5th grade of elementary school until high school to join Kembang Kuning Camp. For almost 16 kids, it was their first camp and also the first time going out of town without parents. The Residence of Taman Dayu is the place where they were enjoy the camp. We praise and worship God, pray, hear the reflection, play outdoor activities, games, swimming, basketball, badminton, candle light dinner, bonfire, and “making a short film”. We tried our best to make that one and half day camp as one of their best experience in life. A moment when they were truly understands that God has a plan for each of them. God had already chosen them because He loves them so much. Like the camp’s theme “Aku Terpilih!”. And in their vulnerable period of life, they know that we’re here to accompany them walk in the right path. Among those activities we tried to know them closer. They shared their stories. One of the girls, with smile, shared about his dad who just get out from the jail and always disallow her to go to church. Without feeling ashamed and angry, she shows me that she love her dad so much. One of the boys is “bonek” and he never miss to watch lively all Persebaya matches. Another kid, this boy always has a good mark at school, like plays guitar, he loves his parents but too shy to say it. Yup, beside that’s the teenagers’ typical, it’s just uncommon things to do for boys, he admitted. That’s okay, we’ll learn to get used to it. Thanks kids, you remind me of my teenage. The most joyful thing is when I saw all their happy expression and their smiling faces while doing all activities. It makes me wondering; maybe I’ve been like them when having my first camp. I observed a lot, nothing could cover who they truly are. Each characteristic appear in their behavior and attitude. Some are not proper but I do realize that they have a different circumstance which molds them day by day. The most excited thing is in the “Making a Short Film”. Actually that is a talent show session, but I want to modify the bored talent show. It was cool; spontaneously they divided the job description in the team. The thinkers become the director and choose the part of the Noah/David/Moses life. Many of them are so excited in making the wardrobe for the drama. We gave them newspaper, and it was scattered all over the room, they cutting and sticking here and there. Snake, cat, bird, king, queen, ark, deer, sword, and so on; were made from the newspaper. What creative kids! The most surprising fact is they don’t know about Jonah! And some of them couldn’t read fluently. The most impressive moment is in the third session when they knelt down, and all the staff touched the kids and praying for them. Tears fell down along with the words that come out from my mouth. They maybe have a different background and different way of life, they are not as lucky as many of us, but I know God loves them same and then one day I’ll see God reveal His plan in their lives. Those kids are so special in God’s eyes. This Kembang Kuning Camp is over but the important step had just begun. We won’t let this momentum of their first camp fade away. With praying and caring them more, we have to show them the better path for their teenage. First experience maybe scary previously but makes you addicted in the end..